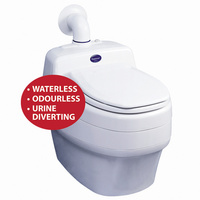 Waterless Toilet for the home. 240 volt 2 speed fan. The Separett Villa is a low energy, waterless toilet, ideal for homes or cabins, offering a superior standard of personal convenience at an affordable price. 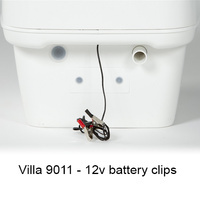 ​Villa 9000: with 240 volt, 2 speed fan. 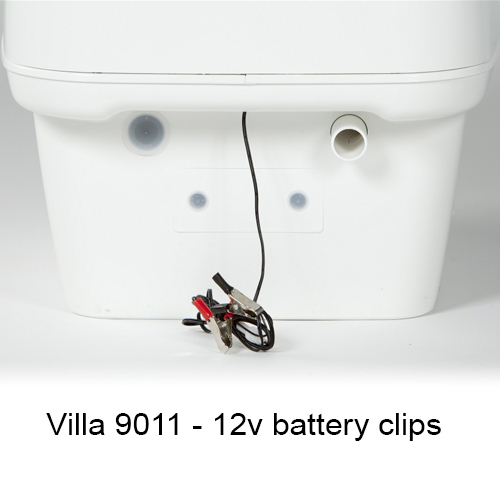 Villa 9011: with 12 volt, single spped fan. Comes with 12 volt power leads, plus transformer plug for optional use with 240volt system. Child seat is available as optional extra. 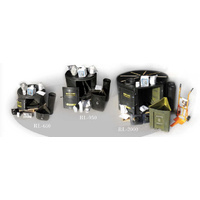 Also available - Villa 9020: with a shute for under floor solid waste collection. This model has a 12 volt fan. 240v fan unit can be fitted to convert to 2 speed model if required. 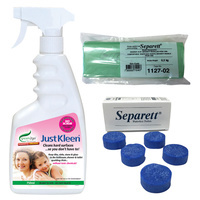 Please go to the product page for this product to see more details and to place an order. NO HEATER to dry liquids from the solid matter. 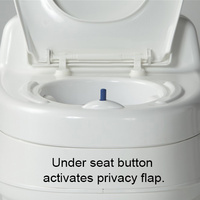 Urine is separeted from the solids under the seat by way of a cleverly designed urine diverting 'bowl'. 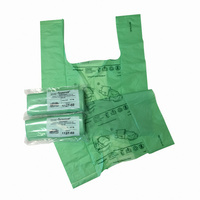 Solid waste is collected in a bin under the seat, that is lined with a hygenic biodegradable bag. The Villa ships with 3 bins, which can be used in rotation. If time permits the 3rd bin may be fully composted by the time it is needed. Otherwise, the partially composted matter can be transferred to a compost bin or burried. Alternatively, the bags can be added directly to an external composter, where they should be composted for up to 12 months. Each bag lined bin holds approx 60 uses. That's one month for 2 people! The venting duct can be installed straight through the exterior wall making the Villa ideal for slab floors or installations without underfloor access. This video shows how easy the Separett Villa is to install. Easy change of container. 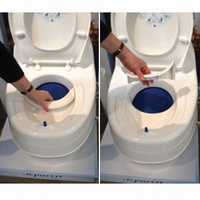 Put the lid over the container and use the sliding surfaces to remove the container from the toilet. 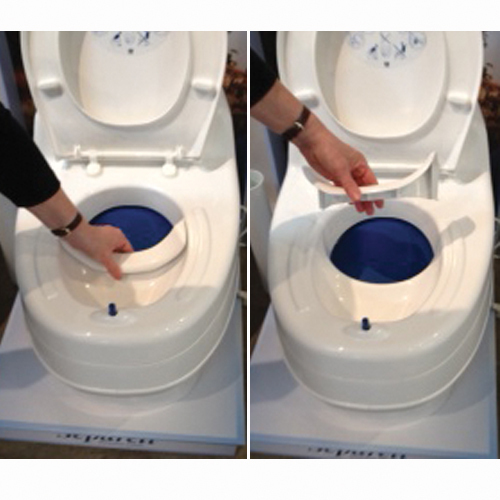 Place a new container in the toilet and line with a biodegradable bag to simplify composting and cleaning. 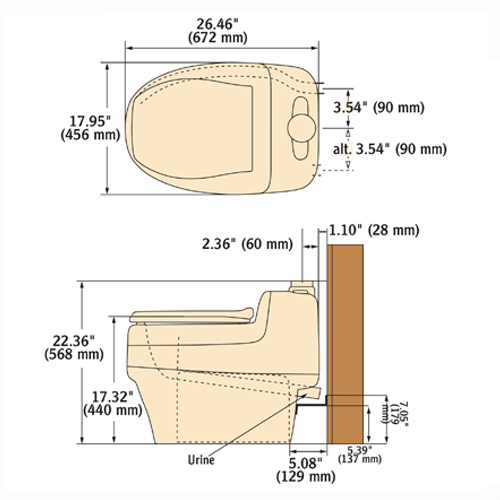 Download the Installation Instructions - Separett Villa 9000 & 9010/9011. Separett Villa ranges comes with a 5 year manufacturers warranty, on all parts except fan. We feel qualified to review this product as we are long term compost toilet users. Currently we are a family of 4 adults in a rural residential zoning. We are responsible for our own effluent disposal here & rely on rain to fill our water tanks. 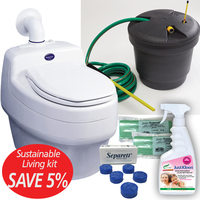 We switched to a composting toilet 10 years ago because we were flushing so much of our precious rainwater down the toilet, we considered this a huge waste. So our composting toilet has been our only household toilet since then. 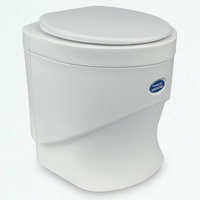 We purchased our Separett Villa 9011 three weeks ago replacing a Ecolet Manual toilet. 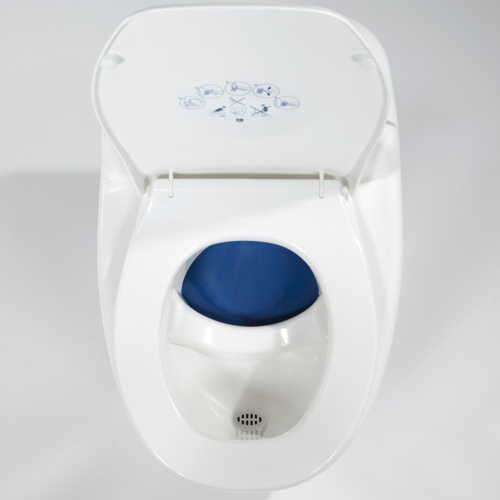 The reason we chose the Separett Villa 9011 is because it looked like it had a very functional urine diverter. Believe me... we have come to understand that wee and poo should not be mixed....if they were meant to be mixed we would have been given one hole! Our previous composting unit did not do this & it was pretty awful to deal with until we retrofitted a urine diverter into it. 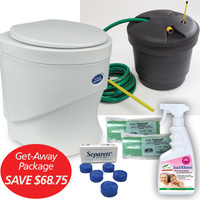 The Separett Villa 9011 comes with an excellent urine diverter. 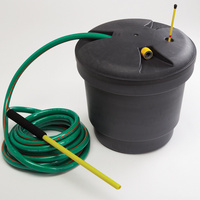 We divert our urine off into our grey water tank which is then pumped out automatically when it reaches a certain level, via a submersible dirty water pump. Installation of the Sepparett was slightly tricky, only because the waste pipe we were diverting our urine into was directly underneath the air vent outlet on the Separett. The urine outlet on the Sepparett is offset to one side, so make sure you have 3 or at least 2 elbows to get the pipe going in the correct direction as the supplied pipe is quite thick & not flexible enough for tight bends. The Sepparett also comes with a built in 12V/240v fan, this takes any smell up through the vent pipe. This toilet is really easy to use & we are really happy with it. The privacy screen works well, it opens when you sit on the seat & closes when you stand. Underneath the privacy screen their sits a large bucket which you line with a bag. 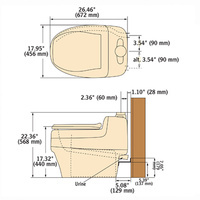 The bucket sits on a mechanism which gets rotated each time the seat is depressed. This gives good dispersal to what goes into it. 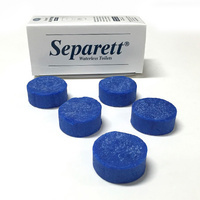 The other good thing we have found about the Separett, is that along with your 'solid' waste.... paper, sanitary items & used toilet rolls can all go into it. This is because in our case as we are on a farm, we choose to burn our 'bag' once per week in our fire drum instead of composting it. This saves us having to have a secondary smelly bin beside the toilet to put such things into, which is not pleasant. The bag contents burn really well as it contains a lot of sawdust & paper, and is pretty dry. There isn't a trace of anything left afterwards & the ash when cool, is safe to use in the garden. We have found that the bucket is needed to be emptied after 7 days with 4 adults using it. It is super easy to empty as the seat lifts up & is held at the sides by 2 levers, there is ample room to remove the bucket & it is remarkably light to carry. We have found before removing the bucket its best to tie the bag up put the lid on & remember to wear gloves. The unit comes with several buckets & lids, cleaning the bucket is easy, we then put it out in the sun & replace it with another one. Cleaning the unit inside and out is also very easy. As we are in the sub tropics we spray some insect surface spray into the bucket housing & under the seat as we are prone to attract those small compost flies in hot and humid conditions. The only fault I can find is that in order to deter the little bugs, the under-seat vents could be screened to stop them entering into the unit, and the vent fan could have choice of a higher speed especially for 240v use. Overall it is a 100% improvement on what we had before, & customer service has been very prompt & helpful. I can highly recommend the Separett Villa 9011.
does exactly what it's supposed to do, and looks good doing it. however, the 'screws' supplied for fixing to the concrete floor are of poor quality, the heads sheared off two of them using a battery powered drill. the external waste water connector (with internal blue seals) requires a good deal of pressure on both sides to ensure a proper fit - this is obviously a good thing, but should be clearly stated in the instructions. otherwise we're very happy with our toilet. As many people, we were at first quite sceptical about this toilet, but we really did not need to worry. This toilet when in use has no smell at all an is very easy to use and clean. We have it now for 3 months including full time use during the Christmas period and had no worries at all with it. It is installed inside the house in our small holiday cottage. The installation was quite straight forward too. Compost from the Villa to the garden. I bought a Separett toilet from you a few years ago. All good, no complaints, just want to pass on something I've learned about dealing with the solid wastes. I compost it and add it to my garden when it is just gorgeous innocuous earth, crawling with worms. And here is the best way to break it down. I put hay or grass on the bottom of the pan when I change it. When it is full enough, I put freshly pulled grass on top and lid it for two or three months. When I open it, it is already halfway to compost but then I tip it in my sealed plastic compost bin and cover it with grass again. Usually takes a year or so for compost to mature - of course, there are other things in the compost bin as well. The addition of grass to the bin, at the start and at the end, speeds the decomposition process greatly. That's my tip. Thanks.